BOSTON, MA -- Another week is in the books for the Eastern Hockey League Premier (EHLP), as this past week featured all 13 teams in action. With a full slate of games, we once again had plenty of worthy candidates for this week's awards. 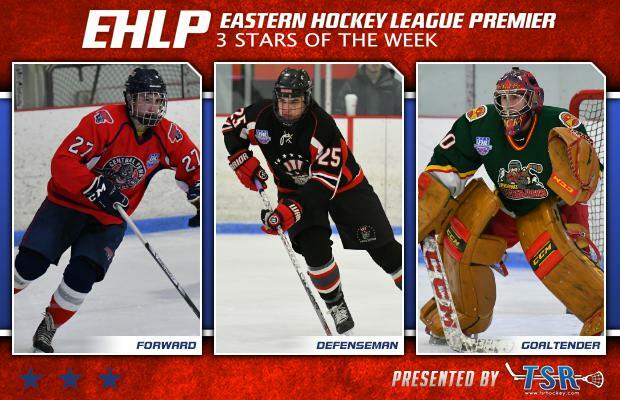 The EHLP is pleased to announce that Thomas Aughey (Philadelphia Jr. Flyers), Nathan Trull (New England Wolves), and Leo Lake (Valley Jr. Warriors) have been named the TSR Hockey Stars of the Week. The action continues with all 13 teams hitting the ice for the final EHLP showcase of the season. This weekend's event is set to take place on Friday and Saturday at the Revolution Ice Gardens in Warwick, PA. The next set of TSR Hockey Stars of the Week will be released following the showcase on Monday, January 22nd. Catch the EHLP action all season long on HockeyTV. Aughey and the Jr. Flyers lost a pair of hard fought battles this past weekend, but scored 9 goals as a team in the 2 games. Aughey recorded a hat-trick against the New England Wolves on Sunday, in his team’s 6-5 shootout loss. The '99 scored another goal against the Vermont Lumberjacks in the evening, to cap off the double-header. The native of West Chester, PA finished the week with 4 total goals, with 2 of them coming on the power-play and 1 coming while his team was short-handed. After this past week, Aughey now has 15 goals and 9 assists (24 points) on the season. The Jr. Flyers will look to bounce back this upcoming weekend at the final EHLP showcase, when they take on the Central Penn Panthers and the New Jersey Renegades. The Wolves split their 2 games this past weekend and Trull made his impact felt from the blue line, while racking up 4 total points. The '98 defensemen had the Wolves only goal in their loss against the Philadelphia Little Flyers on Saturday. The Berlin, NH native then led the way on Sunday with a short-handed goal and 2 assists in the Wolves 6-5 shootout win over the Philadelphia Jr. Flyers. Trull leads all defensemen on the Wolves in scoring this season with 9 goals and 7 assists (16 points). This is the defensemen's second EHLP honor this season (TSR Hockey Stars of the Week #15). The Wolves will get back to work this upcoming weekend at the final EHLP showcase with games against the New York Applecore and the Central Penn Panthers. The Warriors won 1 game and lost 2 this past week, as Lake was 1-1-0 in his 2 starts. On Wednesday, Lake stopped 30 shots in a 3-1 loss against the 1st place Vermont Lumberjacks. The '97 netminder was terrific in his next start on Sunday against the Boston Jr. Rangers, stopping 37 out of 38 shots in his team’s 3-1 win. The native of Rhode Island has collected a pair of wins since joining the Warriors in late November, and currently owns a 2.30 GAA and .925 save percentage. Lake and the Warriors will travel down to Pennsylvania for the upcoming showcase this weekend, and will matchup against both the Philadelphia Revolution and New Jersey 87s. 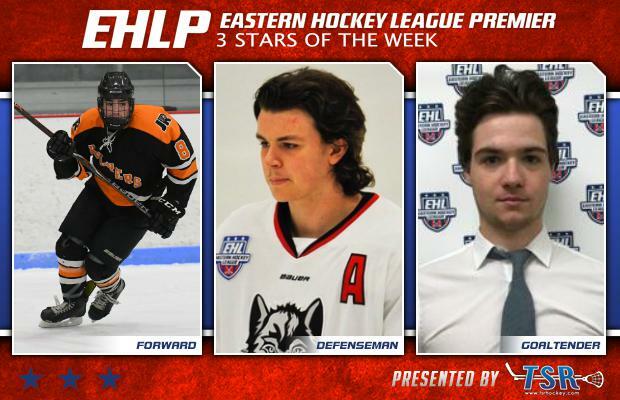 The EHLP would also like to recognize a trio of honorable mentions this week starting with Bryce Ricker of the New England Wolves. The '98 forward led the way with a hat-trick and an assist in the Wolves 6-5 shootout win against the Philadelphia Jr. Flyers on Sunday. Kyle Washkalavitch collected a goal and 4 assists in the Jr. Flyers' 2 games this past weekend, bringing his season point total up to 30. Garret Baldacci of the Central Penn Panthers recorded his first shutout of the season this past Sunday, stopping all 36 shots he faced in his team's 2-0 win over the New York Applecore.